Migraines are a type of headache that may occur with symptoms such as nausea, vomiting, or sensitivity to light. In many people, throbbing pain is felt only on one side of the head. People who get migraines have warning symptoms, before the actual headache begins. An aura is a group of symptoms, including vision disturbances, that are a warning sign that a bad headache is coming. Migraine headaches can also be triggered by certain foods and artificial sweeteners. We are taught to believe that there are many kinds of headaches. Tension, sinus, cluster, migraine, and TMJ are among the most frequently diagnosed. For many years, the myofascial pain professional community has recognized that more than 90% of all these headaches occur because of an underlying myofascial pain condition. Children of all ages get headaches too. According to recent medical research, children are generally under-treated and their pain conditions are less likely to be taken seriously. What are Alternative Options for Menstrual Migraine? Menstrual migraines are headaches that occur most commonly during the last two weeks of a woman’s menstrual cycle. They can start in childhood. Many girls and women find relief with prescription bio-identical progesterone. 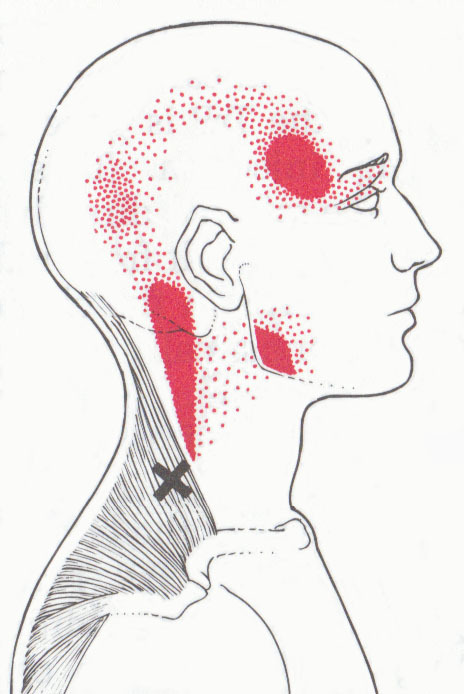 Myofascial trigger points in the muscles of the scalp, jaw, neck, shoulders and upper back refer pain to the head and face. These illustrations are from Travell and Simons medical text book. 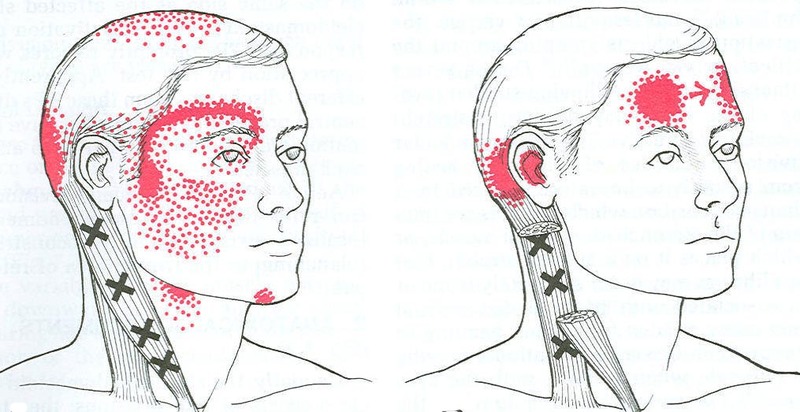 The “x’s” represent the locations of trigger points, and the red dots illustrate the locations of referred pain. This first diagram is of the sternocleidomastoid muscle. 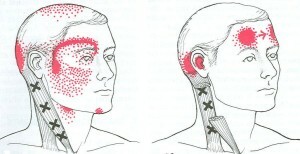 Notice that it causes pain in forehead, sinus, ear and back of the head areas. 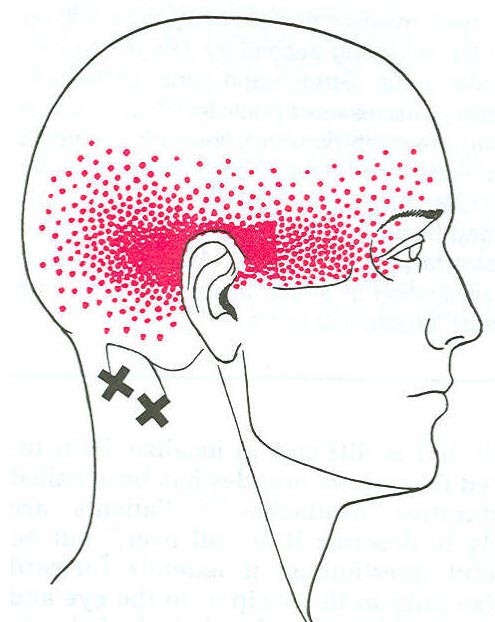 Myofascial trigger points in the muscles under the back of the skull radiate pain to the back of the head, and around to the forehead. 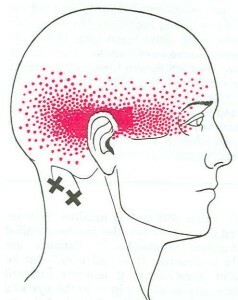 These trigger points cause tension headache and migraine headache. The pain is actually caused by the knots in the muscles that are called myofascial trigger points. We know this because when the knots are made smaller, the pain is less. When the knots are made to go away, the pain is gone. After life threatening causes for the headache have been investigated by family physicians and neurologists, these patients need an individualized comprehensive holistic treatment program. Individualized holistic treatment has been shown to be effective for many headache sufferers. Myofascial medicine has much to offer. Healing Touch, Photon Therapy, Trigger Point Injections, Neural Therapy, Massage Therapy, and Platelet Rich Plasma injections can all be helpful. The Blatman Health and Wellness Center offers people an opportunity for holistic education, treatment, and direction for getting better. No single therapy has much chance for success. Simply medicating a headache is not enough. The health status of mind, body and spirit often needs to be improved. Lifestyle changes guided by expert nutritional advice, return to exercise, and reduction in toxic exposures often puts patients back on the path to wellness. Call the Blatman Health and Wellness Center. Prolotherapy treatment is the injection of an irritant solution into a compromised area of the body in order to trigger the body to strengthen weakened connective tissue. The treatment also provides relief from musculoskeletal pain. When injury or strain weakens connective tissue, a prolotherapy injection every three to six weeks can heal the problem. Once treatment has concluded, occasional treatment may be required but full recovery is possible in some cases. Prolotherapy solutions in our office may include lidocaine, a local anesthetic, and dextrose. To learn more about prolotherapy treatment or to schedule an appointment, call our office today!